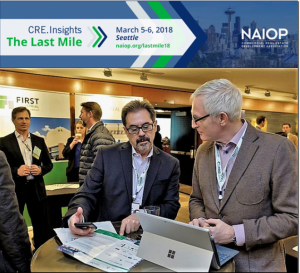 MARCH 7, 2018 – Gordon Walker, Sr VP Real Estate & Development and Harold Goodwyn, Managing Director, attended the NAIOP Conference – CRE.Insights: The Last Mile – in Seattle WA. While the conference focused on major US urban centres, the takeaways are very informative and relevant with respect to the future of e-commerce growth and needs in the Lower Mainland. Conference presentations focused on the importance of the “Last Mile” – that final integral segment of the supply chain process to deliver products from a manufacturer or distributor efficiently and economically to the ultimate customer/end user…. this final Last Mile being the most expensive part of that process. E-commerce in the US is growing at a rate almost 5 times that of traditional in-store retail – This challenges companies in determining where to locate as well as what type of facility is best suited for their needs. • Transportation costs comprise over 50% of the total supply chain cost. By comparison, 22% relates to inventory carrying costs and just over 4% of the supply chain cost is devoted to rent. • Companies are studying traffic patterns and reverse traffic patterns in an effort to reduce the high transportation costs. In many US urban centers, crumbling or inadequate infrastructure significantly hampers Last Mile efficiencies. • Choosing the correct industrial facility or third-party logistics (3PL) company in the best location to store its goods is critical for retailers. Fulfilment centres located near the heart of urban density can provide for cost-effective delivery to the ultimate consumer. • Consumers were satisfied with deliveries within one week of placing their orders only a year ago but today there’s a growing trend towards one-day or even same-day delivery expectations. “People expect to order anything, anytime, and have it delivered anywhere they want it. It’s a challenge for our infrastructure,” stated keynote speaker Gregory Healy, Executive Managing Director – Supply Chain & Logistics, at Colliers International in Greater Los Angeles. • Companies are looking to further reduce transportation costs by utilizing off-hour delivery times and alternative means of delivery other than traditional trucking. In past years, storage warehouses were located outside the urban core, today the theme is “closer is better”. Locating fulfillment centres in the inner urban area is challenging due to high land cost (properties typically are already improved with functional buildings), properties are relatively small in site area and there is a shortage of properly zoned and serviced sites for such use close in to the urban core resulting from the need to rezone those properties for higher density uses, usually residential. As a result, future urban centre facilities are looking to develop upwards….an example presented at the conference was Prologis’ Georgetown Crossroads, a 3-level 589,615 sq. ft. fulfillment centre currently under construction in South Seattle, featuring loading facilities on all three levels. In terms of e-commerce growth, Amazon is by far the largest with Walmart coming in a distant but solid second. Reportedly, Walmart now offers 70 million SKU’s online which is three times what the retailer offered only one year ago. • Even e-commerce grocery is a growing segment in the US market. However, logistical challenges must be overcome, including the delivery of refrigerated or frozen product as well as the fact that most shoppers prefer to touch, feel, smell, and inspect their produce before purchasing so trusting others to do that has limited appeal.